Tally Ho is owned by Leo Sampson Goolden and this site presently just follows his work. Tally Ho, Malcolm Scott painting. Ep 42 -- Cutting the Stern Post – and some BIG plans! EP41: New team, new VISA, new timber! 39. Intermediate Frames, a Storm, and a Christmas Tree! 35. Back to Tally Ho! Back to Work! Episode 25 -- Lofting Tally Ho's lines. Part 2. Episode 23 - The Wreck and the rescue. Episode 22 -- restoring the ship-saw/bandsaw. Episode 15 - Working on a traditional boat in Cornwall, UK, for Ashley Butler. -- Earning some money. Episode 14.1 Buying a new keel timber. Episode 12 - Chainplates and Knees. Episode 10: Deck Hatches and Roller Skates. Episode 6: Leo starts work on Tally Ho herself. Episode 5: Off working for a while, then fit the workshop for living. Tally Ho has arrived in her new home! Getting ready for the movers. First funds raised and interest in the challenge. Tally Ho is now owned and in restoration by Leo Goolden. For the present I'll continue to run the site here, though it is offered to Leo if/when he wants it. Shortly after her arrival at Sequim, awaiting a tent and restoration. 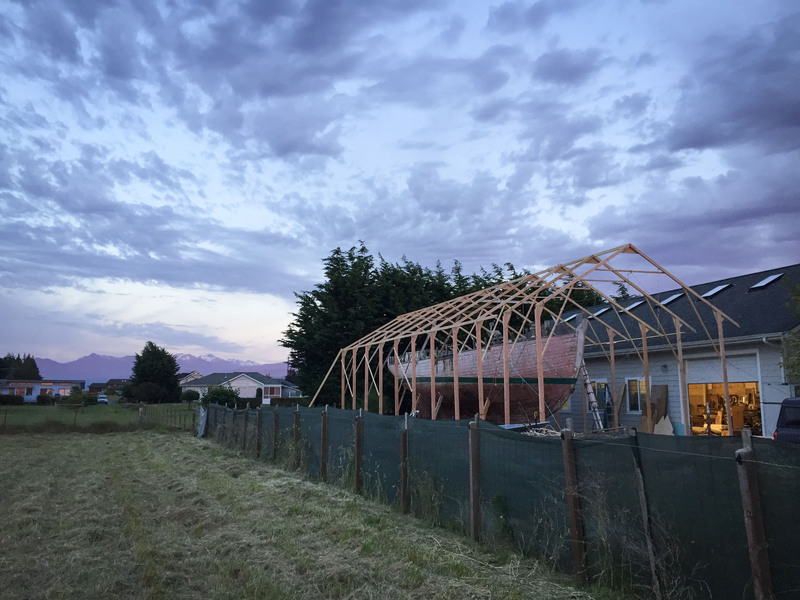 Leo making good progress on the shed. Tally Ho as she was in 1927. Tally Ho and La Goleta rounding the Fastnet Rock. A Painting by David Cobb. Watercolour painting of Tally Ho. A year at sea in the 1950s. Leo Goolden, Tally Ho's new owner. A few people have suggested that it might have been simpler, quicker and cheaper to build a new boat rather than restore this one ... and they'd be absolutely right ... it would be much easier and much cheaper. But that's not the point. If this was about the easiest and cheapest way to own a boat, you could just go out to pretty much any marina in the world these days and get a bargain that you can sail away in, for just a few grand. 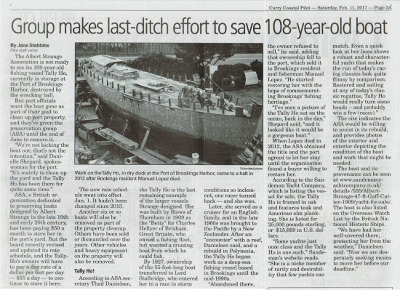 This is about rebuilding a historic vessel and saving it from destruction. It's about something that I think is worth doing. It's about making a good story and it's about, more than anything else, of the magic of sailing or a very old boat. It will be a mix of a vessel that's over 100 years old and one I've built myself and for me those are two of the most romantic, wonderful ideas that you could have. Well ... safe is relative. We at the Albert Strange Association have huge faith in Leo, but this is a huge undertaking, which he is doing himself. He alternates between working on Tally Ho and working as crew on some large sailing vessels. He's documenting what he does and puts that on his website here: http://sampsonboat.co.uk/, and we also mirror that on this site (in the Blog). Tally Ho Is An Important Historic Yacht. She was designed by the great yacht designer Albert Strange, has had a long and colourful life and looks set fair to have yet longer and yet further colour. The Albert Strange Association wish Leo well with the project. We will continue to follow Tally Ho's progress. The yacht Tally Ho is an important historic British vessel, designed in 1909 by the great Albert Strange as a powerful cutter yacht for the owner of one of the first steam trawler fleets in Britain. She was built for him to ‘cruise in comfort while indulging in deep-sea fishing’ by Stow & Son of Shoreham under Lloyd’s survey to the highest class. That heritage gave her the beauty of an Albert Strange design with the power and seaworthiness of a pilot cutter. Amongst her many achievements was winning the 1927 Fastnet Race in near storm conditions where only two yachts of the fleet managed to complete the race. 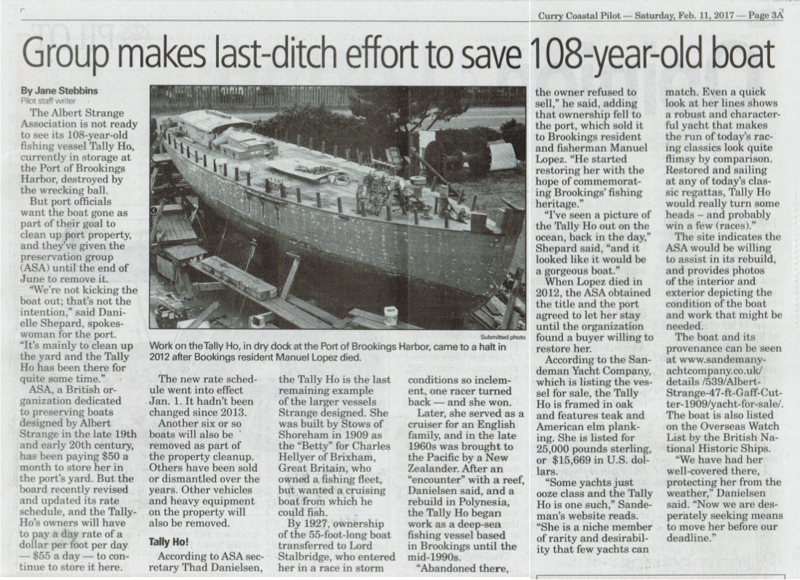 Tally Ho represents a now very rare opportunity to restore a most capable classic cruising yacht. Few restorations of this quality and pedigree remain today. All the Beauty of an Albert Strange yacht with the capabilities of a pilot cutter. The Albert Strange Association would like to give a special thanks to Sandeman Yacht Company for acting as a broker for the sale of Tally Ho and for getting Tally Ho featured in several advertisements and articles, despite knowing that a modest return for the effort was the best that was likely. "...Tally Ho, working toward the Lizard under reefed main and spitfire jib. High though the seas rose, she seemed as steady as a church, and we watched her in silent admiration. Here indeed was a competitor..."
And here indeed is a yacht worth saving.